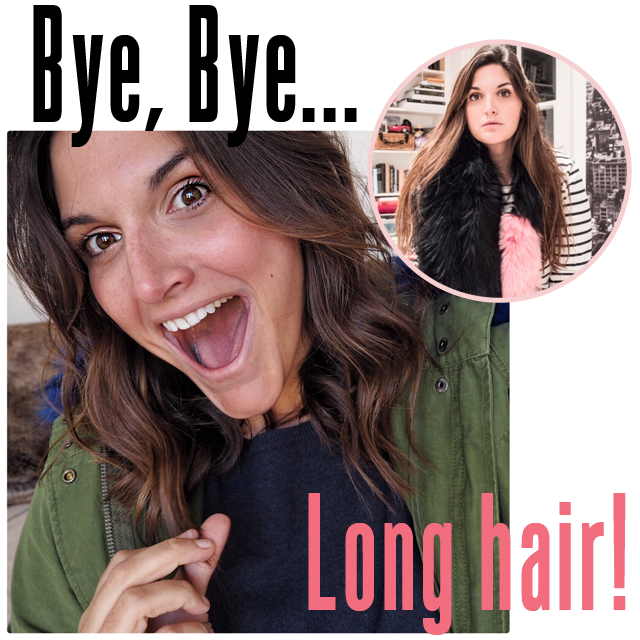 Chop, chop... saying goodbye to 5 1/2 inches of hair! The time has come... I've been talking about it for ages. I must have written about going in for a big haircut on FFG at least a dozen times by now. Hairdressers I have trusted for ages all told me not to do it. Most of them were right - I was chopping for all the wrong reasons. And you need those people in your life, right? These are the ones that talk you down off a ledge, they keep you from making mistakes. For that, I am eternally grateful. But, last week I made a decision that I was going to get the cut. I had been drooling over blunt bobs for months and I was pinning my own hair back to replicate the style without the commitment. In a nutshell, I was ready. Federico and I had a good chat. I showed him some pictures of what I was looking for and he gave me a glimpse of how much he would chop off to get the desired look. And here's what happened next... and I love this... Federico and I talked about my haircuts in the past and what I've loved and loathed. Mainly I've hated how everyone has always felt the need to thin out my hair. Am I wrong in thinking that hair is supposed to stay looking at thick as possible? That's how it looks healthy right? Well, Federico, aka Edward Scissorhands, gave me a cut that not only has amazing movement, but also looks thicker now than it ever did before. Yes, that is real magic. Now there's much more to come with all of this as naturally I videoed the whole thing and it will be a part of the web series I'm launching next week. So stay tuned. But for now, I couldn't help but give Federico and Josh Wood Atelier a special shout out for giving me the cut of my dreams. I quite honestly feel like a weight has been lifted from my shoulders... oh wait, it has! And you know you'll be seeing a lot more with what I can do with this new style. Basically, it's going to be all about hair for a while. Brace yourself!